This Handbook will guide you through the entire Giant Jamboree, from what to expect on Thursday night practice sessions all the way up to the awards ceremony on Monday. Please read through this guide! It contains useful instructions and information that will ensure your Jamboree experience will go as smoothly as possible. We’ll be tweeting news, updates, and answering questions as well. The city of Boston and the surrounding suburbs have a public transportation system that is comprised of buses and subways. You can find more information about the MBTA at www.mbta.com. The Giant Jamboree will be held at the Hynes Convention Center, located at the Hynes Convention subway station on the MBTA Green Line. It is accessible via the B, C, and D branches of the Green Line. The iGEM 2014 Giant Jamboree will be a multimedia event. We willv be uploading photos and videos from the entire event so others can get an idea of what iGEM and the Jamboree is like. In order to comply with the law, all participants attending the Giant Jamboree must agree to the terms of the general release form on the registration website. Note: There will also be blank copies available at registration if you did not agree online prior to the event or if you are registering on site. If you have any questions or need further clarification, feel free to ask an iGEM staff member. Check in at the Hynes Convention Center starts at 2:00 pm and ends at 9:00 pm. Registration will be located on the 2nd Floor, see map for details. At Registration, each attendee will pick up a registration booklet, name badge, and other important and useful information. Keep in mind that registration check-in is on an individual basis, instead of by team as in previous years. Check in at Registration by the last name on your registration record. You will receive your name badge as part of your registration materials, as long as you have submitted your general release form. Please wear your badge at all times during the Jamboree and make sure it is clearly visible. Badges will be necessary for entrance into presentation rooms, for access to refreshments, and for the iGEM social event. If you do not have a badge, you must register in order to obtain one. Teams will be allowed to practice on Thursday night (October 30) at Hynes Convention Center, beginning at 2:00pm. You can practice your presentation, and get to know fellow iGEM members. There are a limited number of rooms available, so please sign up online to reserve a room and time slot. The presentation rooms are 207, 208, 210, 302, 304, 306, 309, 311, and 312. Practice sessions will run until 9:00 pm. We cannot match the practice room with your actual presentation room. Remember, other teams will be practicing as well, so be sure to leave your practice room on time! Please leave all presentation rooms in the condition that you found them. Note: There will NOT be technical staff on hand to help with audio/visual equipment. Be sure to bring any equipment, such as laptops and adaptors, with you. The Opening Ceremony will officially kick off the 2014 Giant Jamboree! The opening ceremony will be held at Veterans Memorial Auditorium at 8:00am on October 31st. Be sure to attend, as we will also announce any new changes to the Jamboree and the events planned for the next few days. At the Giant Jamboree, there will be nine presentation rooms throughout the Hynes Convention Center. Your team’s scheduled presentation time slot, session, and room have all been randomly assigned. Please see the program booklet for information on when and where your team will be presenting. Presentations will take place on Friday, Saturday, and Sunday. 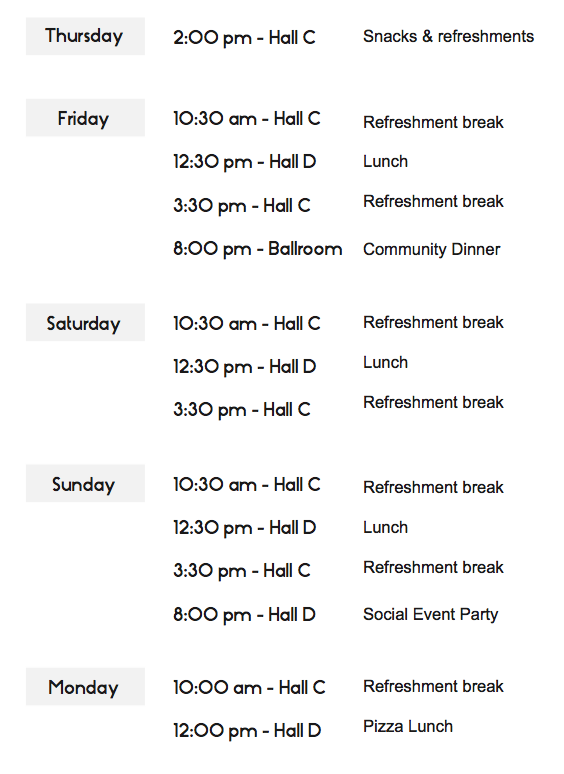 The schedule for presentations is divided into sessions based on track. If you are attending a presentation, please be courteous, stay for the whole session, and only leave the room during the scheduled breaks. Each team has 20 minutes of presentation time, 5 minutes for questions and answers, and 5 minutes to switch with the next presenters. Teams can use Powerpoint or Prezi programs to give their presentation. Please be aware that we will ask for PDF copies of all your presentation slides, so be sure to prepare these in advance. The presentation screen sizes are 4:3 aspect ratio, though 16:9 aspect ratio presentations will also look fine. The projectors are native 4:3 (1024 x 768). While there are no specific requirements, presentations should focus on the achievements of the team, and can include laboratory results as well as achievements outside of the laboratory (ex: Policy & Practices work). Note: Please be sure to bring the necessary equipment for your presentation, such as your laptop, cables/adaptors, and power supply, as iGEM will not provide these. Each team is required to present a poster at the Giant Jamboree to judges and Jamboree attendees. Poster locations have been randomly assigned between the poster areas. Please see the poster information pages in the program booklet for your team’s specific poster location. The poster must be no larger than 1.219m x 1.219m (4ft x 4ft). Poster boards will be set up in each location and teams will be provided with materials to attach their poster to the poster board. Each team may only put up ONE poster. All teams should set up their posters on Thursday evening. All teams must remove their posters by Monday morning. Any remaining posters will not be saved. Poster judges will be evaluating throughout the Jamboree on Friday, Saturday, and Sunday. Expected components and evaluation criteria for posters can be found on the Poster Guidelines page. In an effort to capture all of the hard work that teams have put into their iGEM projects, we ask that each team give us a copy of your presentation and a copy of your poster.To submit your files follow the instructions below. • Save your presentation and poster as a pdf file. • During the scheduled breaks, bring your files on USB key to the Information Desk. • An iGEM staff member will transfer the files to a computer at the Information Desk. Join the whole iGEM community for our first ever Jamboree banquet dinner. Celebrate iGEM and get to know new friends over dinner. 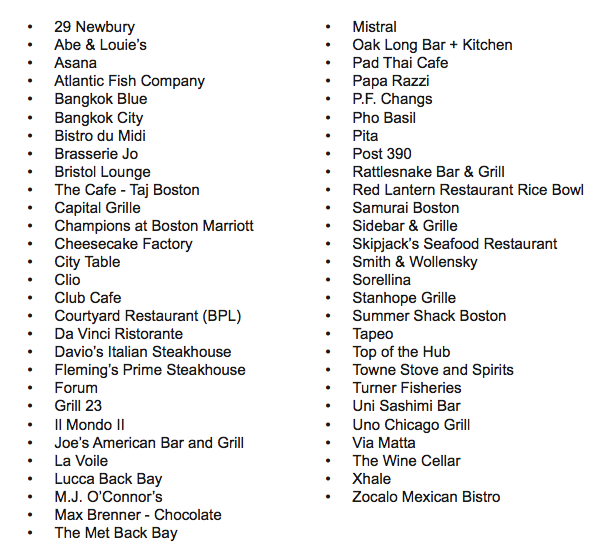 Explore Boston’s restaurants and nightlife during our “Night on the Town.” See a list of area restaurants at the end of this section. This year we have a full social evening scheduled. First, a concert featuring local Boston bands, followed by a DJ dance party lasting into the morning hours. Costumes encouraged! Remember to bring ID for 21+ cash bar (US drivers license or passport). Run by AlumniGEM — be sure to check out their meet & greet! See the schedule for details. Vote for your favorite iGEM team! This year we are continuing the tradition of the iGEMers’ Prize. One ballot will be provided to each team. Completed ballots can be dropped off at the Information Desk in Hall C. Be on the lookout for your prize ballot and be sure to vote by Sunday night at 8:00pm, at the end of the Poster Session. Questions? Ask a volunteer. The awards ceremony will be held on Monday inside Veterans Memorial Auditorium and will start at 9:00AM. The judges will announce the finalists, who will then be asked to give their presentations again. All teams should be prepared to present, so be sure to bring the necessary materials with you, including laptops and adaptors. After the finalists have given their presentations, the judges will deliberate and the iGEM from Above picture will be taken! Finally, the award winners will be announced and the 2014 Giant Jamboree will officially end! Medals, award certificates, and award boxes to safely transport your crystal trophies will be available for pickup after the Awards Ceremony at the Awards Table next to Registration on the 2nd Floor Main Hallway. Every team member listed on the official team roster will receive a participation certificate. To collect your certificates, please send ONE team representative to the Awards Table in the Registration area on the 2nd Floor Main Hallway after the Awards Ceremony on Monday. Always wanted to have an official iGEM hoodie or polo shirt? Now is your chance to purchase one or several. We will also have other iGEM merchandise available for purchase so be sure to check out the store kiosk in the main Registration area. Note:that items will be available on a first-come, first-serve basis. In the event that an item runs out, leave your name, contact information, and preferred item(s) on the interest list and we will be in touch if and when we are able to fulfill your order. Need a place to unwind and relax? Stop by Room 300 for a quiet place to recharge. If you are making use of the Quiet Room, please respect others in the room by keeping conversation to a minimum. Have questions throughout the event? Look for help from an iGEM volunteer in the green t-shirts. Wireless internet is provided by the Hynes Convention Center. Connect to the Hynes Convention Center network for complimentary access. If your team submited a banner for print and display, you can take it home after the event. Take the banner with you but please be sure to return the stand it comes with. See a volunteer after the Awards Ceremony in Veterans Memorial Auditorium to retreive your banner. Remember to turn back your clock one hour on Sunday at 2:00 am! Daylight savings time ends that day so you will have an “extra” hour Sunday. Have you developed an iGEM game and want to share it with the iGEM community? Join us in some friendly competition as we host a ‘Game Room’ for you to showcase your creativity and bring a fun and playful atmosphere to your project. Meet us in room 301 anytime from October 31 to November 03. Tables, seating, and outlets will be available. The following meals will be available during the course of the Jamboree. Please note, breakfast will not be provided on any of the days. Be sure to eat breakfast before arriving at the Jamboree. Attendees can obtain a PRUferred card which will provide them with discounts at 44 shops and restaurants at the Prudential Center next to Hynes Convention Center. PRUferred cards can be obtained from the iGEM HQ desk or from the Customer Service Desk in Center Court inside the Prudential Center.